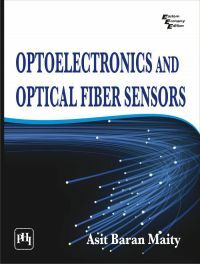 Optoelectronics and Optical Fiber Sensors is a comprehensive and well-organised book that covers wide aspects of optoelectronic processes, optoelectronic devices, mostly used optical fibers and optical fiber sensor systems including maximum technical discussions. The text highlights the details of design, material selection and working processes as well as the limitations of various optoelectronic devices and fiber-optic sensor systems. Throughout the book, an attempt has been made to cover every important point related to this field from the fundamental concepts to the recent advancements as well as the future scope of the technical development in this exciting field. Primarily designed for a course of optoelectronics/optoelectronics and fiber optics/optical fiber sensor at both undergraduate and postgraduate levels in electrical and electronics engineering, electronics and communication engineering, electronics and instrumentation engineering and applied physics, it would also be appreciated by practising engineers and scientists who want to update the information related to the latest developments in this field. • Provides an enormous information regarding the optical interactions, processes, devices and various other related topics to enlarge the scope of the book. • Includes an in-depth presentation of important derivations to enhance the level of understanding. • Incorporates a considerable number of worked-out numericals to reinforce the understanding of the concepts. • Includes many pedagogical features such as chapterwise summary, exercises including probable problems and question bank and relevant references to provide a sound knowledge of various processes and systems. ASIT BARAN MAITY is the Professor and Dean in School of Applied Sciences, Haldia Institute of Technology, West Bengal. With wide experience in teaching and research, he is the recipient of Jawaharlal Nehru Memorial (U.K.) Fellowship for postdoctoral works at Imperial College, London and University of Bath, U.K. Dr. Maity has published/presented several research papers in national and international journals/conferences. His research interests include photonic materials, nano-optoelectronic devices and sensor systems.